Twenty-four VPC members (including newcomers Ben, Bethany, Kristina, Greg, Lawrence and Nina) showed up at our March meeting to hear about our topic "Green Fountain Pens". 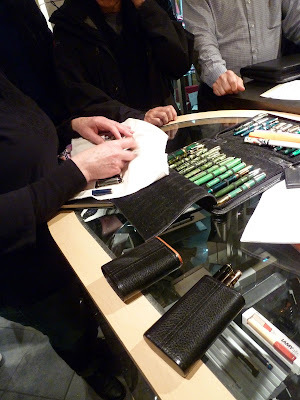 Both vintage and modern pens were well-represented; many thanks to those who brought examples for the night's theme. No worries if you don't have anything that matches a meeting theme---just come and see what others have brought! 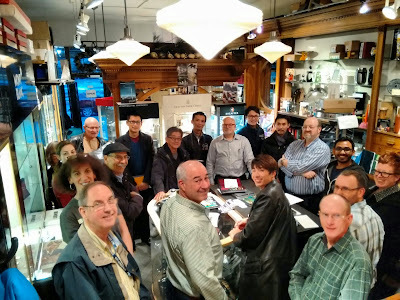 Photo above: Going around the table counter-clockwise, from lower left corner: Ralph, Maja, Bethany, Penny (hiding behind Bethany), Bill M, Mido, Tony, Kiyoshi, Ben H, Glenn M, Michael Q, Lawrence, Bill S, Arvin, Kristina, Greg, Stuart, Peter and Bruce. Not pictured: Suzanne (Bill S' wife) and Richard (photographer). 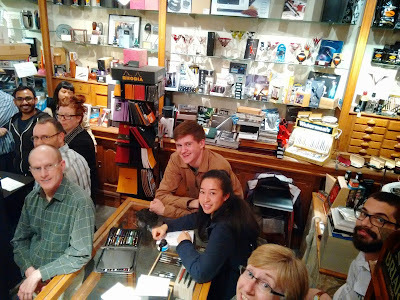 Photo above: From L-R, from center of photo: Jeff, Nasya, Richard's friend Joyce and new Perks employee Assaad. That's Mido's vintage Sheaffer flat top, a fountain pen which was first produced in 1924, and was the first successful plastic fountain pen (there's an interesting article on this model here on Jim Mamoulides' invaluable website). 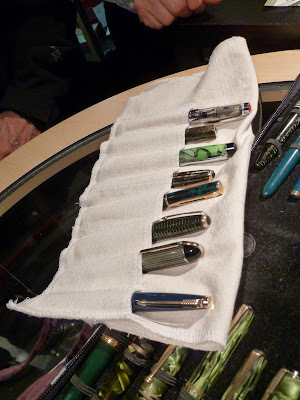 These particular flat-tops were made of cellulose nitrate (Sheaffer's called theirs "Radite"), a celluloid material that discoloured over time due to outgassing from the rubber sacs holding the ink. 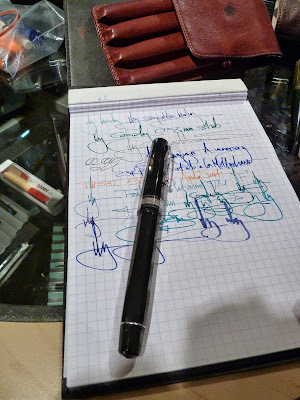 In any case, it's a classic vintage pen from a pen company that is still around! 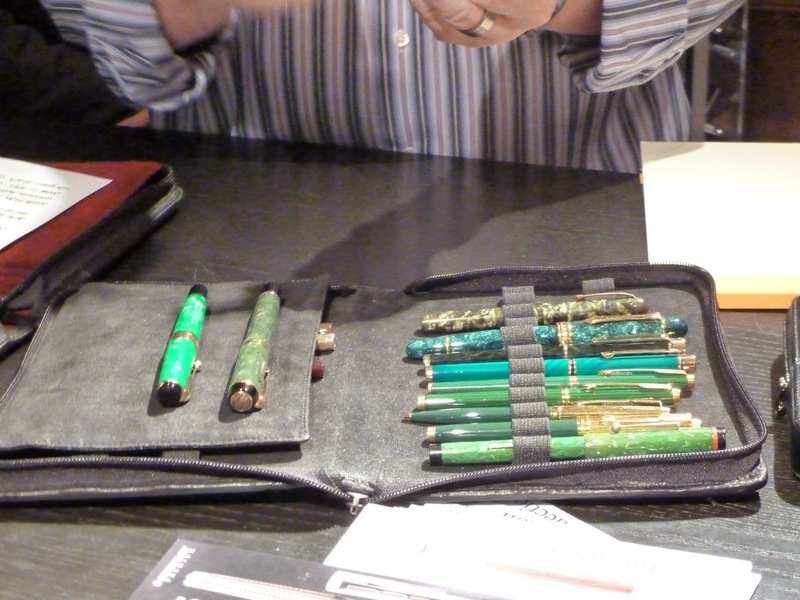 Penny brought several green pens and you can see my own 24-pen case in the background. I forgot to snap a photo of it, but I might add one later to this post. 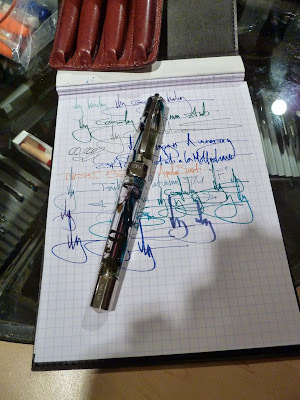 A close-up of the green fountain pens Penny brought. 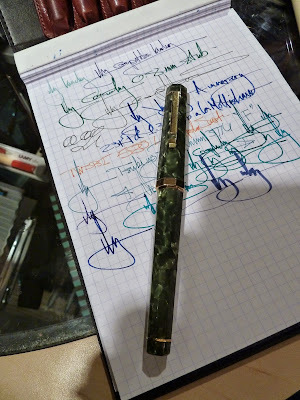 If you click on the image to enlarge it, you will see (from top to bottom) a TWSBI 'Diamond 580' in green, a vintage Waterman '3V' model, a Monteverde 'Prima' in Green Swirl, a vintage Parker striped 'Duofold', a modern Waterman fountain pen (sorry, don't know the model), a Parker Vacumatic, a vintage Wahl-Eversharp 'Skyline' and a Parker '17 Lady' fountain pen. A nice mix of modern and old pens! 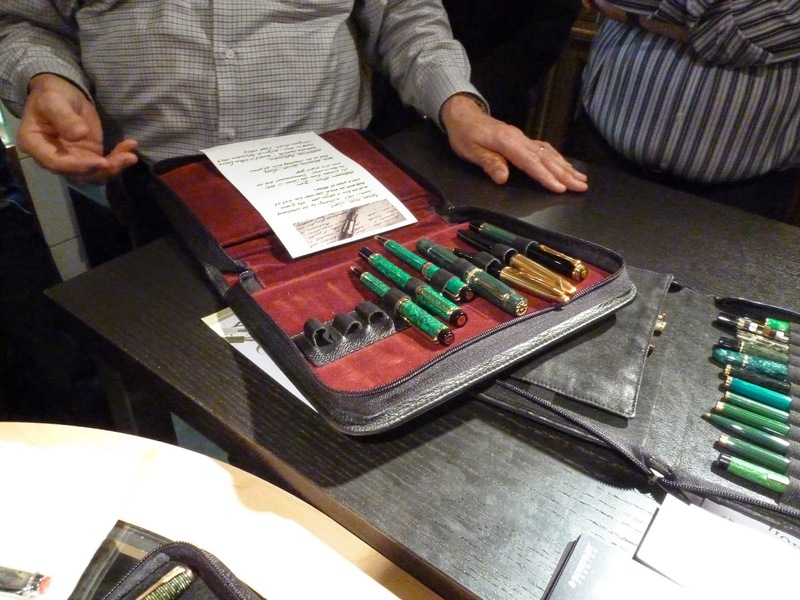 Glenn M brought in some really nice modern fountain pens in green, including (from L-R in the pen case above) a three-pen modern Waterman 'Patrician' set, a lovely Satin Green Dolcevita Fusion Star (Glenn did a nice writeup on it here ), a Waterman 'Edson' set and a Pelikan M800 (I think...or it could be a M1000!). That's Glenn trying out the green TWSBI Diamond 580 Penny brought to the meeting. It's a great value for the money, and will probably be one of the pens members bring in for this month's meeting, whose topic is "Best Modern Fountain Pens Under $50". Included in the pens Bill brought are a couple of lovely green Sheaffer 'Targa' pens, a model by ClassicPens, and some rare Parker '75' pens in green. 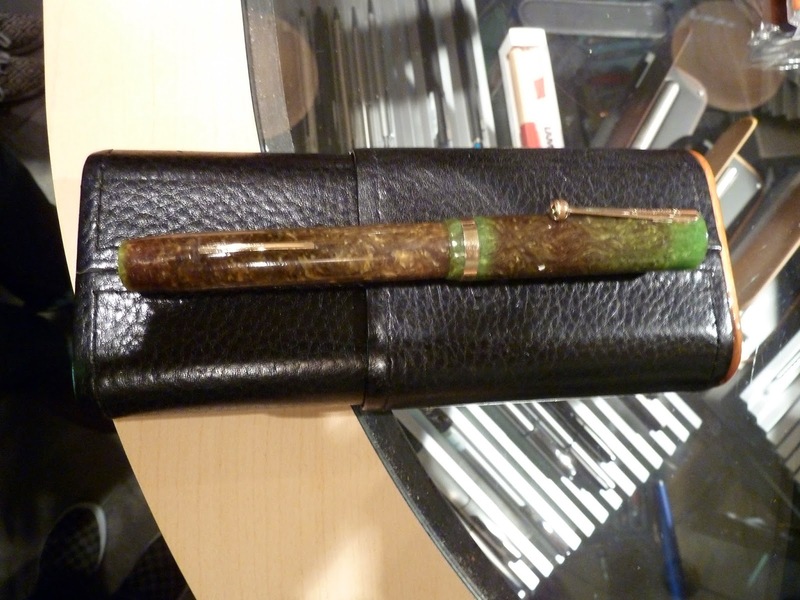 This is Stuart's beautiful vintage Sheaffer ringtop...Note that there is less discolouration of the celluloid material in this example compared to Mido's flat top above. 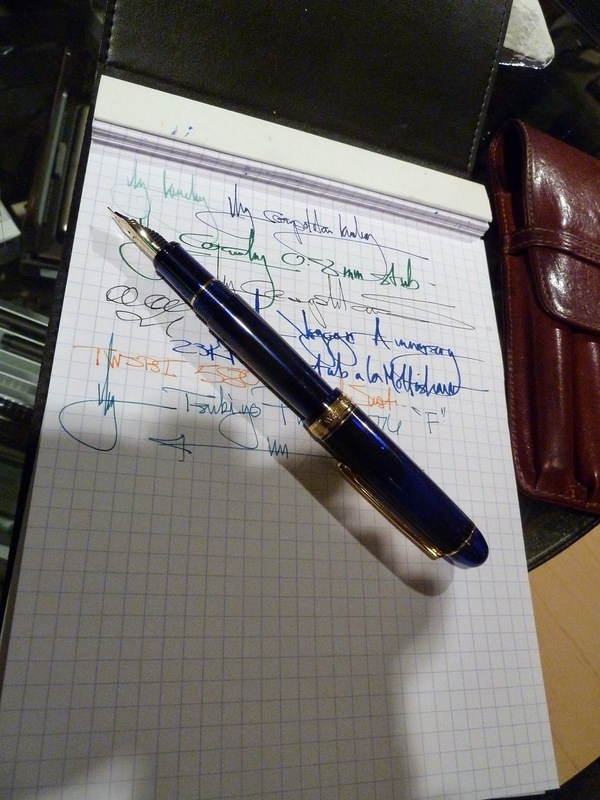 Pens with no discolouration tend to fetch higher prices compared to their discoloured counterparts. That's Bruce's Retro 51 'Double Eight' in the limited edition green colour. 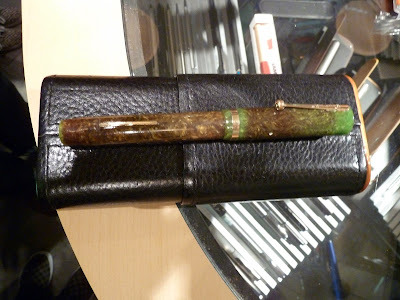 A lovely modern pen made of gorgeous material. 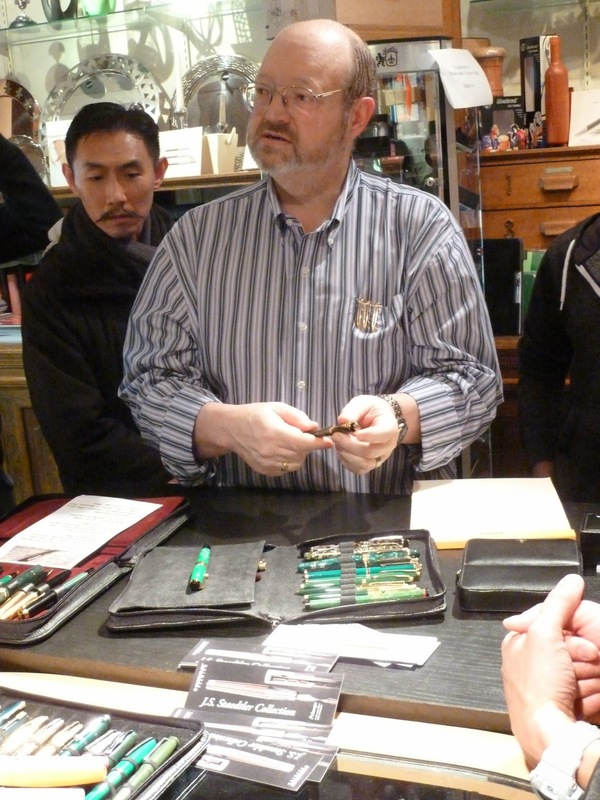 Bruce giving us a writing sample of the pen above. 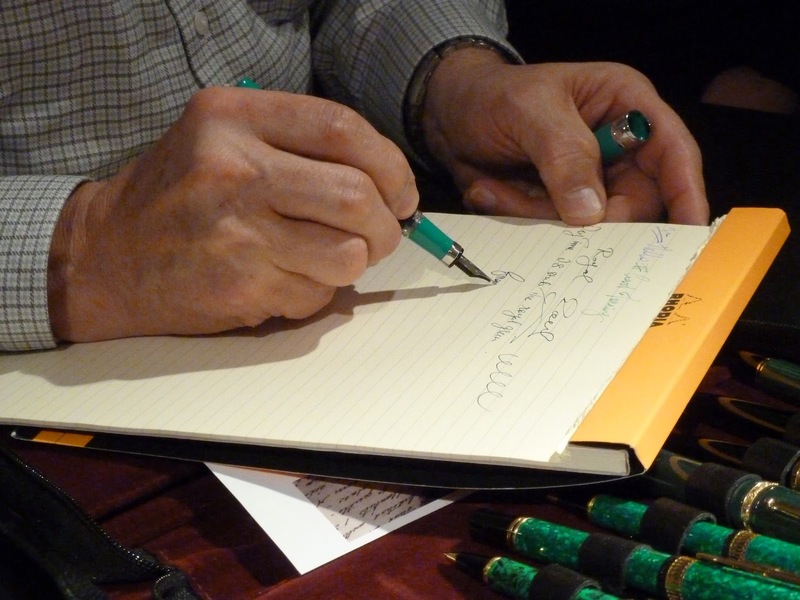 It's not a small pen and can be held comfortably unposted. 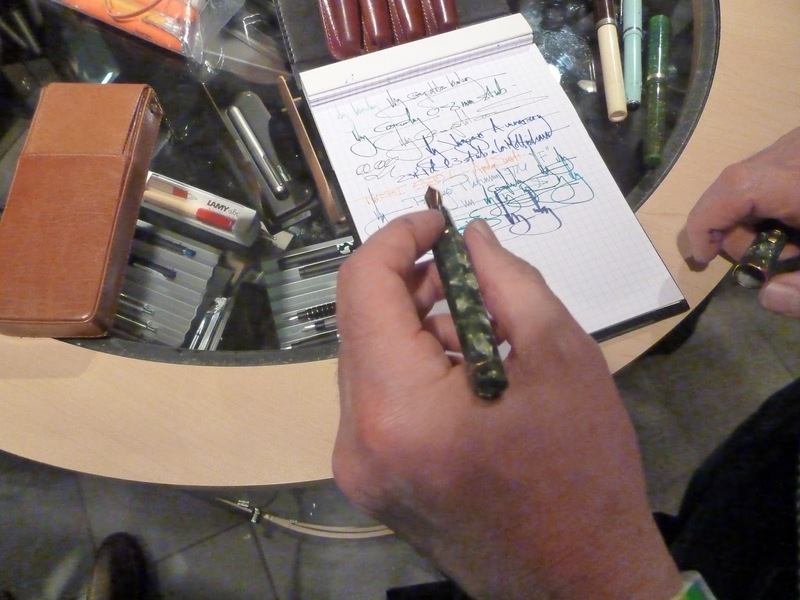 The ever-popular and highly-desirable Omas Arte Italiano Arco fountain pen. 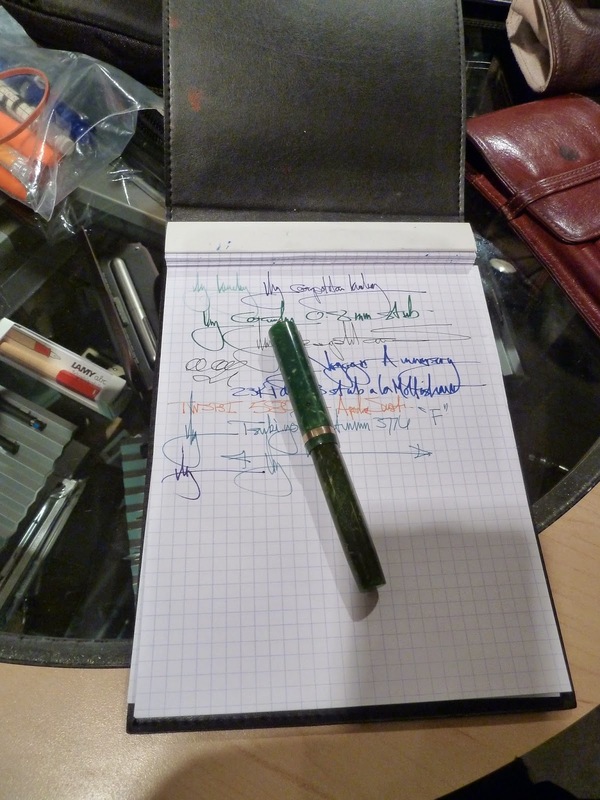 I believe Bruce's example in the "Verde Green" colour is the old style pen. ...and this is Peter's Platinum 3776 Demonstrator in Chartres Blue, a new pen he recently bought. It is filled with Noodler's Baystate Blue, a lovely ink that can stain materials, but with a blue pen that isn't so much of a worry ;) ~~~~~~~~~~~~~~~~~~~~~~~~~~~~~~~~~~~~~~~~~~~~~~~~~~~~~~~~~~~~~~~~~~~~~~ Well, that's all for now! Our next meeting will be held on Thursday April 16th at Perks on Cambie Street, at the same time (6:30pm - 8:30 pm or so) and the topic will be "Best Modern Fountain Pens Under $50" (please limit to 2 pens). Hope to see you there!